This illustration to the Akbarnama (Book of Akbar) was designed by the Mughal court artist Mukund and painted by Shankar. It depicts Rai Surjan Hada, the ruler of Ranthambhor in north-west India, submitting to the Mughal emperor Akbar (r.1556–1605) in 1569, after a fiercely fought campaign of immense strategic importance to the expanding Mughal empire. 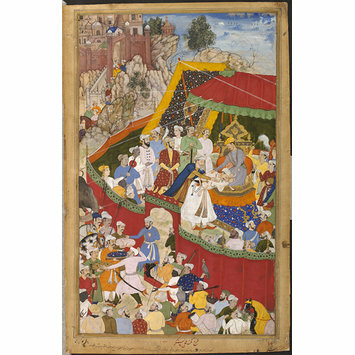 Akbar is shown seated on a throne under a canopy, with the raja bowing in submission before him. Painting, in opaque watercolour and gold on paper, Rai Surjan Hada, the ruler of Ranthambhor, submitting to Akbar. 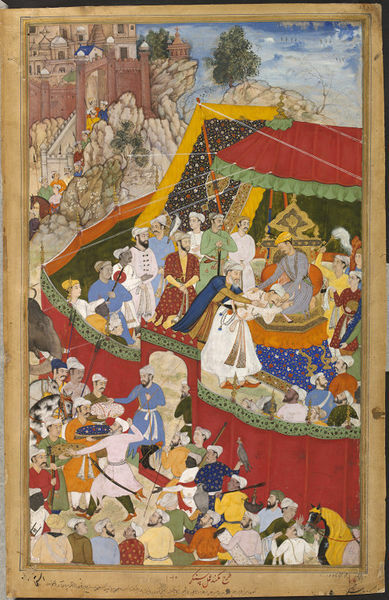 Akbar is shown seated on a throne under a canopy. The Raja is shown bowing in submission before the emperor. Contemporary librarian's attribution in Persian written beneath the image at the bottom of the page in red ink. The Akbarnama was commissioned by Akbar as an official chronicle of his reign. It was written by his court historian and biographer Abu'l Fazl around 1590, and illustrated during the same decade by at least forty-nine different artists from Akbar's studio. After Akbar's death, the manuscript remained in the library of his son, Jehangir. The Victoria and Albert Museum purchased it in 1896 from the widow of major General Clarke, an official who served as the Commissioner in Oudh province. the canopy above the emperor’s head are all emblems of royalty.